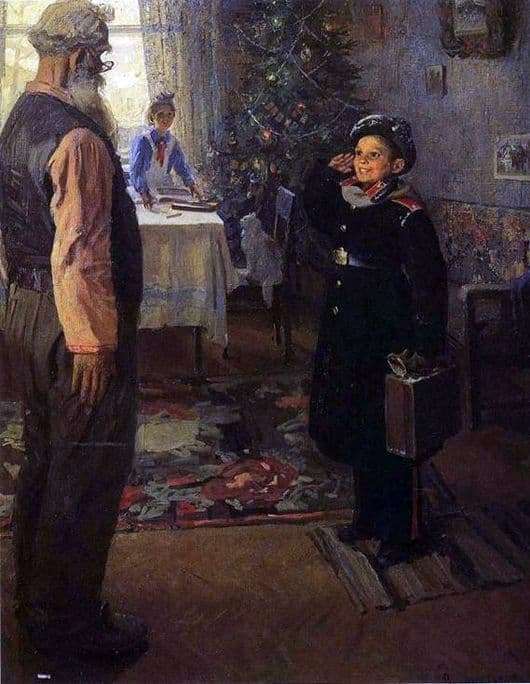 The painting “Arrived on Vacation” by Fedor Reshetnikov is a work whose popularity among the author’s works is comparable only with the painting “again two”. In 1949, she even won the Stalin Prize. The New Year holidays came, and the Suvorov residents were allowed to go home. Like this boy in the picture, with a suitcase in hand and in full form, he stands at attention in the hallway on the doormat. It is evident that the boy is happy to see his family: he smiles and defiantly gives a report to his grandfather. Grandfather, perhaps once a former military man, seriously accepts a report. And, although we do not see his face, one can guess that in a moment it was lit up with a happy smile. A festive atmosphere reigns in this ordinary Soviet room: the Christmas tree is already decorated, the sister, wearing a formal school uniform, cleans and sets the table, and the cat sitting on the chair waits patiently for something tasty from the New Year dinner. The photograph hanging on the wall is a portrait of a military man who may have been this gray-haired grandfather. But here we understand that the family is depicted poor, as evidenced by the situation in the room, and the state paid for children in the Suvorov schools, provided that the father did not return from the war. And there is almost no doubt that the portrait depicts the father of the boy. One of the themes of the picture is the connection and continuity of generations. The boy, like his father or grandfather, chose an army service for himself and, it seems, has already achieved success in it. We see on the wall a reproduction of the painting “Three Bogatyrs”, who have set themselves the goal of defending the Russian lands, and we have a Suvorov citizen in front of us, who probably will soon become a worthy defender of his Homeland! Despite a small sad overtones, the picture literally radiates optimism and makes you smile involuntarily. As already mentioned, the picture became very popular in the USSR, and the number of stamps and postcards with its image exceeded thirteen million.